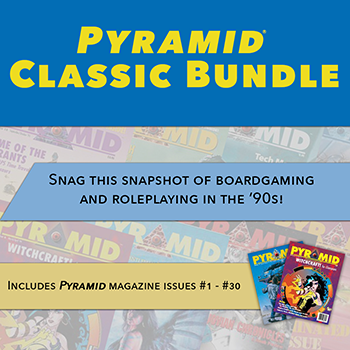 Daily Illuminator: Pyramid & Roleplayer Bundles Now On Warehouse 23! March 28, 2017: Pyramid & Roleplayer Bundles Now On Warehouse 23! The dream of the '90s is alive! And the late '80s as well. Get ready for some nostalgic reading material, because we've got some retro bundles available now on Warehouse 23! 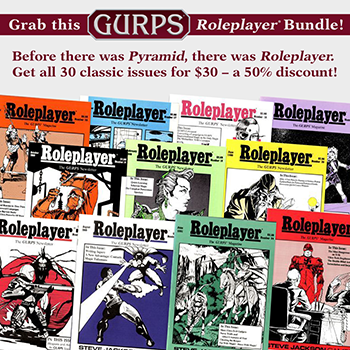 For an even older time capsule, you can check out the Roleplayer bundle, composed of all 30 issues of the magazine! Perfect for the GURPS fan who has everything, it's a look back at the history of the game, before we even released GURPS Basic Set. If you have an interest in classic GURPS and roleplaying gaming, or you're just a fan of retro gaming in general, this is a great snapshot of SJ Games' history. These bundles of vintage resources are available for a low price for a limited time, so fill out your radical '80s and '90s magazine collection today!